Every home is different. That’s what makes each property so interesting. But one thing that can make a place stand out from the rest is its cabinetry. Whether in the kitchen or the bathroom, cabinets contribute to a home’s unique personality. In addition, distinctive cabinetry may make all the difference in selling homes to prospective buyers. As a realtor, I’ve always been intrigued by the importance of kitchens and bathrooms when marketing a home in Summit County. So I reached out to David Preaus, who co-owns Creative Cabinetry with his partner Trip Butler. David explained that their Breckenridge-based business truly comes from a love of cabinetry design. Furthermore, David feels their company is set up to help homeowners and potential second homeowners obtain their dream kitchen or bathroom. David also added that both he and Trip work closely with homeowners to help them make the best design decisions for their particular property. If you’d like to learn more about what David and Trip could offer your home, check out the Creative Cabinetry website. You’ll surely be impressed with their work! 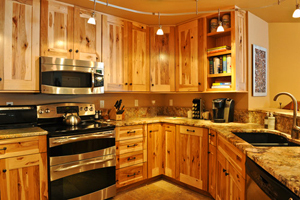 Creative Cabinetry is just one of many fabulous small businesses that are here in Summit County. If you’d like additional facts about the local companies you can find in this awesome area, I’m happy to give you whatever information you need. I’m also available to help you buy or sell a home in Summit County. Whatever your real estate needs happen to be now or in the future, I can help you through the process from beginning to end. Whenever you have a chance, take a moment to check out the available listings on my website. You might see a property that could really meet the needs of you and your family.